Thursday at 3 PM The AIR presents a special episode of Radio Free Charleston International, a tribute to John Wetton, a progressive rock icon, who passed away Tuesday at the age of 67. 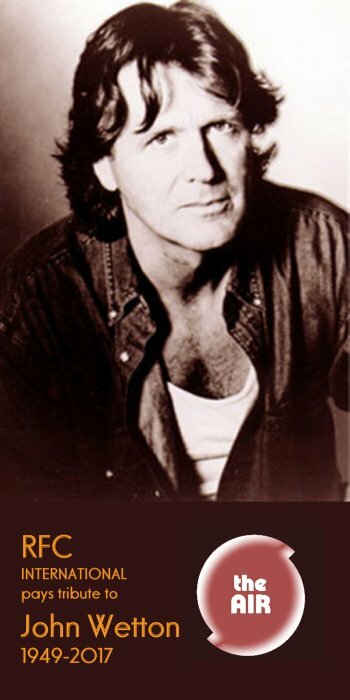 John Wetton was best known as the lead singer, bassist and one of the songwriters for the hugely successful Progressive Rock band, ASIA, but his prog-rock pedigree stretches back further than that, with notable stints in King Crimson, UK, Roxy Music and Uriah Heep, among others on his list of credentials. Following his exit from ASIA in the late 1980s, Wetton continued to collaborate with ASIA keyboardist, Geoff Downes, and also released a series of solo albums. He participated in a limited reunion of UK, with Eddie Jobson, and also contributed to several progressive rock tribute CDs, collaborating with stellar talents like Adrian Belew, Keith Emerson, Rick Wakeman and Alan White. The original line-up of ASIA reformed in time for their twenty-fifth anniversary in 2007, and recorded new albums that recaptured the vitality of their younger days. The reformed ASIA toured until Wetton’s health issues became too much for him to continue. Wetton succumbed after a long battle with colon cancer Tuesday morning. This week, since Prognosis is on hiatus following a flu outbreak at Haversham Recording Institute, Radio Free Charleston International host, Rudy Panucci, took it upon himself to assemble a two-hour salute to one of the greatest voices in rock. In this show you will hear studio and live tracks featuring John Wetton from ASIA, King Crimson, UK, ICON, and Wetton himself, solo and in collaboration with other great musicians. Today on The AIR listeners can tune in at 1 PM for brand-new episodes of two great talk shows, On The Road with Mel and Life Speaks with Michele Zirkle Marcum. This week On The Road with Mel takes requests. Mel asked her listeners to chime in via social media with their favorite driving music. At 1:30 PM, with a replay at 7 PM, on Life Speaks, Michele Zirkle Marcum explores the benefits of losing things, and how sometimes when you lose things, they come back when you least expect it. After Life Speaks, Mark Wolfe talks with Kth Allen on The Best of The Real with Mark Wolfe, and we are then treated to two hours of musical theater on Curtain Call with Mel Larch. The AIR continues with an evening of music, talk and comedy, and at midnight you can check out seven hours of Douglas Adams’ The Hitchhiker’s Guide To The Galaxy.